Military Listings - Dorset Rd. The 1BD condo has been completely renovated in the last couple years. It is available at end of April/Beg of May (flexible). These lease will run until end of May (flexible-with option to renew). I am relocating for my job, but have lived here for the last two years. It is immediately off Interstate 95, and close to Baltimore, Washington DC, College Park, and Fort Meade. The condo is tucked back in a quiet neighborhood, but within minutes of restaurants and shopping. The bedroom is very large with an enormous walk-in closet that already has custom shelving. I think the previous owners even put a small bed for a child in the walk-in. I'm able to fit my queen size bed, large armoire, and have lots of extra space. 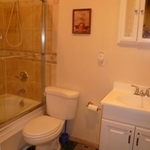 The bathroom was completely torn out and redone 2 years ago with marble floor tiling, new toilette and vanity, beautifully designed bathtub area with Jacuzzi tub. 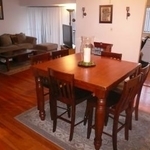 The living room, dining room, and kitchen (all spacious) also have brand new hardwood floors. There is a large balcony off the living room. 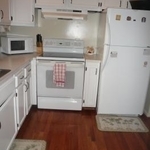 The kitchen is enormous for a 1BD condo, and even larger than most townhomes. I purchased a new fridge about a year ago. It also has a washer and dryer in the corner. The $1200 covers the rent, water, and condo fees. It also includes access to the massive pool in summer months. There is a cute park right next door. The electric is separate, but is manageable as long as air/heat isn't run constantly. This is a non-smoking condo!